Hello all in the greater Charleston, S.C. Metro area, otherwise known as the Lowcountry. We have a lot of advantages living in this area, to include the weather. These conditions can make for a great environment to grow Koi. But this also can make us a little lazy especially in the winter time. Today we are going to talk about dealing with our swings in weather. We can go from 60 to 30 and back to 70 all in the same week. We will talk about why Warm weather is more dangerous to your fish than cold temperatures, during the winter. Warm weather is more dangerous to your fish than cold temperatures, during the winter. For those of you living in the Lowcountry, this time of year might bring about some periods of cold and warm weather. For example, we have had a few days of freezing colds already this season along with days back up in the 70’s. Some of you might think this is great news! 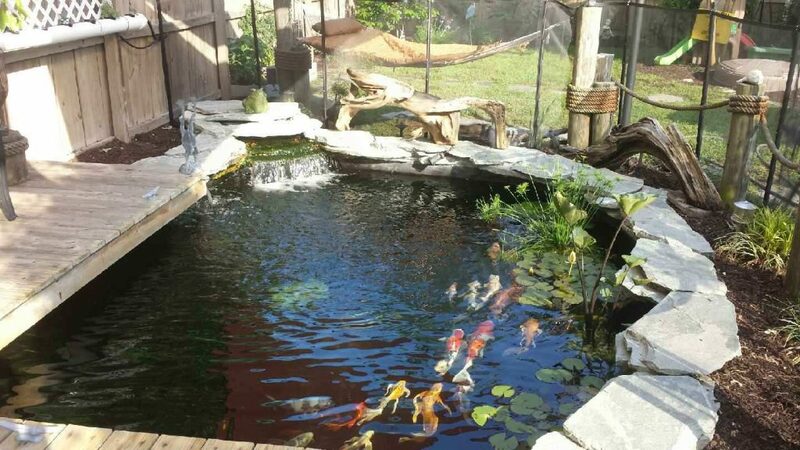 The ponds will warm up and your fish may even start perking up and swimming around. A few warm days will do them good right? That is so WRONG. Cold and warm weather pose a huge threat to your Koi for reasons that we will explain. Ammonia, the toxic chemical produced by the fish and by decaying material in your pond, is normally processed by the nitrifying bacteria in your biofilter and converted into less toxic chemicals. However, in winter the cold causes this biofiltration to stop by killing some of the nitrifying bacteria and forcing the rest to go dormant. Whether you run your filter or not, your biofilter doesn’t remove the ammonia in winter (at least not as fast as summer to really make a difference). While many people might test their pond’s ammonia levels diligently in summer, very few of us Koi-keepers continue to test their water in winter. This is usually not a problem because even though it’s not being removed as it normally would in summer, ammonia is much less toxic to your fish at lower temperatures. In fact, in water below 45 degrees F, ammonia is harmless to your fish. So even if there is ammonia in your pond in winter (and there usually is since your biofilter’s not removing it), as long as the water’s cold enough, it can’t hurt your fish. My pond for example rarely goes below 50 degrees F. Last year when the Charleston area had the ice storm my pond went down to just below 40 degrees F.
Water temperature above 45, any ammonia present in the pond can be toxic. Ammonia reading of .25 ppm won’t hurt your fish if the water temp is below 45, but it will stress your fish more and more as the water warms up. Another problem is that during warm spells, your fish become more active and produce more ammonia. Their bodies respond to the warmth by speeding up their metabolisms slightly: they start “breathing” more rapidly, and their digestion systems start moving a little faster. Like the fish, the bacteria in the pond also become more active and some start feeding on any organics in the pond. All of these processes increase ammonia production. Our ponds in this area normally stay warm enough that ammonia is toxic even in the winter for our fish, but more of it is being produced in the pond, and almost none is being removed by the dormant or reduced activity of the biofilter! This becomes a Triple threat. In short: if the water temp in your pond is above 45, YOU NEED TO TEST YOUR WATER. Test like you would in summer: for ammonia, nitrite, and kH, and fix any of these that are an issue (ammonia and nitrite should be 0, your kH should be at least 140 ppm) just like you would in summer. If your ammonia and nitrite are zero and your kH is at least 140 ppm, you can sit back and relax for the time being. Just keep testing regularly if the water temp is above 45. Problem Two: Bad bugs can be active most of the winter here. Like your fish, any parasites or pathogens that were dormant in your pond during the cold will become active when the water warms. This is why it’s important to perform a fall cleanout of your whole pond whenever possible. Dirt and muck harbor parasites. If you don’t get rid of the muck before winter, those bugs go dormant with the fish until the weather warms again. Then as soon as warm weather hits, they “wake up” and attack your fish. Parasite problems are much harder to deal with in winter because many treatments don’t work at low temperatures. In fact, the only option for treating parasites in winter (without removing the fish from the pond, bringing them inside, and treating them in a holding tank) is to bring the salt level up to .3% (or sometimes higher) and hope for the best. Problem Three: Your fish are already cold stressed. During winter, your fish’s immune systems are reduced along with all their other metabolic processes. They’re conserving energy for basic bodily functions: keeping the gills, heart, and brain working in the cold. This means they’re weak and vulnerable to any additional sources of stress, like poor water quality and parasites/pathogens. In this weakened state, they can’t adapt to any additional stress, so suddenly certain factors that wouldn’t affect them very much in summer can be dangerous in winter. During winter warm snaps your fish are weak when the bad bugs are strong and when water quality (specifically ammonia) could be dangerous. During these periods, you need to watch your water quality and your fish. When we have warm days, you need to test your water and keep an eye out for any abnormal behaviors. This last part is very tricky because the fish are still so sluggish from the cold. If you detect ammonia and your water temp is above 45, (which could be most of the winter here) you need to detoxify until the ammonia drops to a safe level (0). If you observe nitrite, add salt just like you would in summer. If your kH is below 140ppm (100 ppm at the very least), add the appropriate amount of baking soda just like you would in summer. If you start seeing evidence of parasites or pathogens: wounds, white fuzz, fish flashing or laying over, or hanging/ gasping at the surface, immediately bring the salt in the pond up to .3%. All these things are meant to reduce any and all external stress on the fish, since they’re weak from the cold, and any additional stress could easily push them over the edge and kill them. 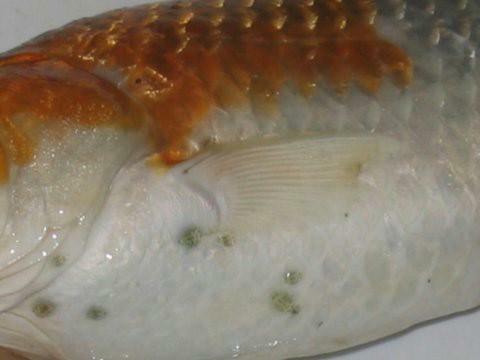 It’s easy for Lowcountry Koi owners to get complacent in winter, but don’t let your guard down. Your diligence is the only thing that will save your fish.